Cookbooks! Ironically, for someone who actively works on trying to reduce my story of stuff, I seem to effortlessly hoard cookbooks. It reminds me of something the Minimalist guys said once on material goods, ‘if it brings you joy, then you don’t have to get rid of it just to get rid of it.’ Well, that must be it for me. My cookbooks bring me immense joy. I love heading to my little cookbook library nook in my office, pulling out one of my favorites and gathering inspiration or a recipe for dinner that night. I read cookbooks like I do books and know my favorites backwards and forwards. While I purge through the stash every year or so, there are a few dozen that I keep going back to. Cookbook season tends to happen twice a year, the heavy hitters coming out first in the spring and once again before the holiday rush. While I always do a round-up of my favorites at the end of the year, there have been so many goodies in the early part of 2017 that I wanted to share what I’ve been loving so far. I selectively decided not to share any that I previously had in one of my favorite things round-ups. But, any of those should be considered worthy of inclusion in this post. 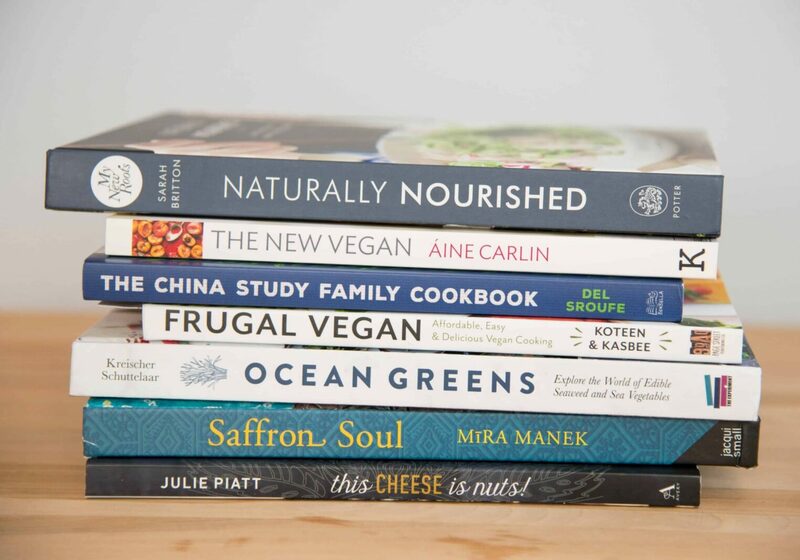 Which cookbooks have inspired you most this year? If you follow My New Roots, then you likely already own this book. While I’m a fan of most of Sarah’s work, I think this is her best effort to date. The recipes, while incredibly delicious, are of my speed- fairly easy to prepare and overall simple in nature. In each chapter she shares several “rollover” ideas, tips for how to use any leftovers with other ingredients to create new meals. I can’t remember how I stumbled upon this book, but I’m so glad I did. I believe the book is designed for those who want to go vegan, but aren’t sure how. However, as someone who isn’t vegan yet prefers to cook this way most of the time, I found this book to be the one I keep going back to over and over again. Whether you eat like me or are fully plant-based, you’ll love the recipes in this one. Similar to above, this book focuses on do-able recipes that are overall simple in nature yet bursting with flavor. I’ve made a dozen of her recipes so far and every one has been a keeper. Plus, it’s currently less than $8 on Amazon, making it a no-brainer purchase. Favorite Recipes: Breakfast polenta with roasted plums, Cookie Dough Balls, Green Lentil and Spinach Curry, Banoffee Pie, Bell Pepper and Spinach Stromboli, Bulgur Wheat bowl with Roasted Veggies. It’s no surprise that I’m interested in more family-style cookbooks as our due-date draws closer. I haven’t decided yet exactly how I’m going to feed this little one, but I know it will be as close to our current diet as possible: lots of plants, legumes and whole grains. This cookbook is perfect for those who want ‘family approved’ meals that still follow T. Colin Campbell’s approach to nutrition: nutrient-dense, low-fat and plant-based. I only just recently added this book to my collection, the idea of budget-friendly meals catching my eye. With tips for affordable cooking and recipes that focus on beans, vegetables and whole grains, this is a great primer for those looking to eat plant-based on a budget. Each recipe also has “splurge” ideas for taking them up a notch. I’ve been wanting to add more seaweed dishes to my repertoire so this cookbook peaked my interest at first glance. While I love basic items like sushi and miso soup, I knew there was a whole world of seaweeds out there but didn’t have the faintest idea of where to start. While some of the recipes are more exotic, this is a great cookbook filled with recipes that put seaweed as the star. I’ve been challenging myself to try one new recipe a month, with delicious results. It’s no secret that I LOVE Indian food. Behind Italian, it’s my second-favorite cuisine and one I gravitate towards often. However, as someone who is mostly self-taught from BL’s best friend Harnoor and Google, I know my recipes could use some major inspiration. This book is completely vegetarian; a modern interpretation of Indian classics with a healthful focus. These recipes have pushed me with combinations I never would have thought of while getting to play with intriguing ingredients. If you love Indian food as much as I do, you’ll want to pick this one up. I think I’ve got a typical vegetarian relationship with cheese; it’s the biggest obstacle for me being completely plant-based, but I really, really, love my cheese. So, as soon as I heard that this book was being released, I immediately pre-ordered it. While I’ve only tried one recipe so far, I have so many dog-eared that I know this book and I will become acquainted very quickly. Most of these recipes are simple, though a few of them require special items like a dehydrator for the aging process. All of the recipes look incredibly delicious and I cannot wait to try the homemade burrata recipe in the next few weeks. If you’re like me, looking to add more plant-based cheeses into your life, then this book is a must. I really liked the cooking tips.